A pdf of the slides I used for a talk recently on the links between earthquake fatalities and poverty, corruption and ignorance. Marcia McNutt, National Academy of Science, Engineering and Medicine. Lying on the floodplains of the mighty Ganges, Brahmaputra and Meghna rivers Bangladesh is a rich, fertile land. These giant river systems meet in the centre of the country and flow together into the Bay of Bengal which, at over 1600km wide, is the largest delta in the world. Bangladesh is often cited as one of the countries that will be most negatively affected by rising sea levels from human induced climate change. Two thirds of the country lies less than 5m above of sea level. With vast regions to the south much less than a 1m above sea level. The Intergovernmental Panel on Climate Change (IPCC) claims that just 1m rise in sea level could directly expose nearly 14 million people and result in potentially 17% land loss in southern Bangladesh. Most of the country receives on average more than 2.5m of rainfall a year, 80% of which falls in about 4 months during the peak monsoon season, resulting in large annual floods. The flood waters bring nutrient rich clays and silts from the high Himalayas and deposit them on the river floodplains. These rich soils produce bountiful harvests of rice and other crops. Unsurprisingly, farming is the most common profession. However floods, once welcomed by farmers and their families are now harbingers of disaster. Human induced climate change has resulted in more erratic monsoon weather patterns with often larger than normal volumes of water being delivered in shorter time intervals. The resulting floods have had devastating effects on the Bangladeshi people. In 2012 three large floods hit the country in swift succession between the months of July and September directly affecting more than 5 million people. These are now a common annual occurrence. Bangladesh is also subject to annual tropical cyclones, storm surges and tornadoes. Some of the worst natural disasters in recorded history were results of cyclonic storms in the Bengal region. Among them, the 1970 Bhola cyclone which claimed over 500,000 lives! Worryingly new research into the impacts of climate change has shown that large cyclonic storms will become a more common occurrence in the years and decades to come. The foothills of the great Himalayan mountain belt has historically been the location of many large earthquakes. Earthquakes in the continent tend to be more infrequent compared to regions such as Japan and California. However this makes them more unpredictable and often unexpected. But when one does occur it can result in significant ground shaking. The 1897 magnitude 8.1 and 1950 magnitude 8.7 Assam earthquakes were two of the biggest to hit the region in recent times. The current building stock in Bangladesh is poorly built and most are not built to withstand ground shaking in an earthquake. The collapse of poorly built buildings is the greatest hazard during an earthquake. So what can we as earth scientists do? Bangladesh has a population of over 160 million and among the highest population density of any country in the world. With the majority of the country built on river floodplains combined with widespread corruption and ignorance a large earthquake could quite possibly result in the greatest natural calamity to have ever hit the country! Bangladesh needs to increase its resilience if its people are to survive the multitude of natural hazards they face. Earth scientists are well placed to understand the risks involved from these hazards and can play a key role in all aspects of building a resilient infrastructure. Climate science research is ongoing and needs to continue to better understand the affect human induced climate is having and will have on the annual monsoon. This knowledge needs to be translated into rainfall variation and flooding potentials and communicated with the people who need this information. The socio-economic issues of a rising sea level needs to be addressed and plans put in place to allow big cities to efficiently absorb and cater for migrants moving away from hazard prone coastal regions. Hydro-geologists and geochemists are helping to find sustainable clean, arsenic free water sources for drinking and farming. Seismologists and earthquake scientists are working to better understand the seismic risk in the Himalayan foothills; produce more accurate hazard maps and importantly identify the active faults within the region. These are to name but a few of the ways earth scientists can get involved. I believe it is our moral duty to translate the practical aspects of our science into real benefits for people. Earthquakes are caused by the sudden release of energy stored on fractures in the Earth’s crust called faults. Every year they are responsible for thousands of fatalities around the world. For this post I’d like to focus on the role of corruption in the building industry and its impact on lives lost in earthquakes. The global construction industry was worth $8.7 trillion in 2012 and is recognised as being the most corrupt segment of the global economy. Corruption in this industry takes the form of using inadequate and/or insufficient building materials, bribes to inspectors and civil authorities, substandard assembly methods and the inappropriate siting of buildings. Spontaneous building collapses even without earthquakes, such as the 2013 Savar factory collapse in Bangladesh, which killed 1129 people, are a stark reminder of the consequences of construction oversight and a terrifying view into what could happen if there is an earthquake in these regions. The 1999 Izmit earthquake (magnitude 7.4) in Turkey resulted in around 18,00 deaths. After the earthquake, inspectors found that nearly half of all the structures within the damage zone had failed to comply with building regulations. Nicholas Ambraseys and Roger Bilham calculated that almost 83% of all deaths from building collapse in earthquakes in the last 3 decades occurred in countries that are poor and anomalously corrupt. Corruption by itself is dangerous but when combined with poverty, it is disastrous. Corruption, poverty and ignorance essentially become indistinguishable for many low income countries. And even if corrupt practices are eliminated these countries will have inherited a building stock that is of poor quality and prone to failure in the next earthquake. A pertinent quote from the famous Charles Richter in his 1970 retirement speech. However, it’s not all bad news. There are some great examples of how reconstruction can happen under correct management and regulations to improve resilience to earthquakes and other natural hazards. For example, in 2012 the Turkish government passed the Law on the Regeneration of Areas Under Disaster Risk. Under these new guidelines all buildings that are not up to current earthquake risk standards will be demolished and rebuilt. The reconstruction of the Macedonian capital of Skopje after it was destroyed in an earthquake in 1963 is another great example. Not only was all the infrastructure rebuilt to be earthquake-resistant, the city planners also ensured that the river Vardar was re-routed in order to control future flooding. Achievements on this scale requires strong governance and management, and transparent national and local administration. With the rapid growth of cities into so-called megacities (>10 million population), often in high earthquake risk regions, this is even more important. We have yet to have an earthquake that has killed a million people. But at the rate these cities are growing under limited to no management, such an event might not be too far in the future. 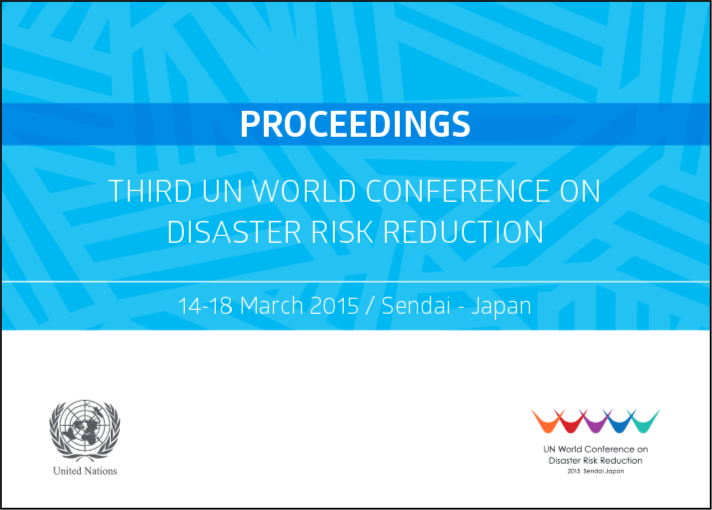 The proceedings from the 3rd UN World Conference on disaster risk reduction is now available online. Governments should pay more attention to the role that bamboo and rattan can play in building more sustainable and greener economies, a pressure group has told a UN meeting. “Bamboo and rattan are not always seen as tools to deliver on the Sustainable Development Goals. We believe they bring major opportunities,” the International Network for Bamboo and Rattan (INBAR), an intergovernmental group based in Beijing, China, told the UN Forum on Forests in New York, United States earlier this month. For example, bamboo can reduce soil erosion and restore degraded lands, and ultimately help protect the livelihoods of people who depend on forest ecosystems. Products derived from the two plants could also bring income to millions of people in developing countries, the group says. INBAR, which has 40 member states, called on policymakers to include bamboo and rattan in their action plans for forest development. 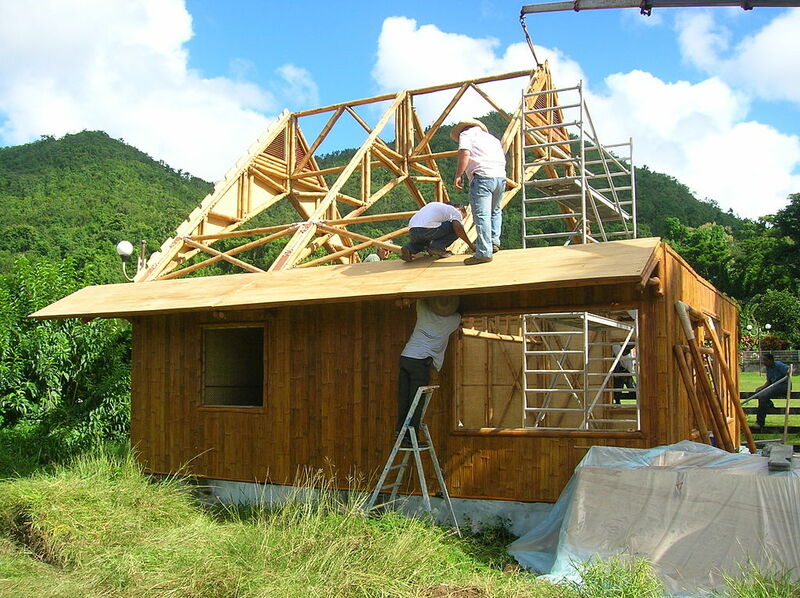 Construction of a 100% bamboo house in Martinique, certified earthquake and cyclone resistant. INBAR also presented the Global Assessment of Bamboo and Rattan, an initiative that aims to exchange knowledge and data about bamboo and rattan. The assessment is expected to be launched at the World Forestry Congress in Durban, South Africa, in September 2015. Bamboo and rattan grow across much of the developing world, including in many equatorial countries in Asia, Africa, Latin America and the Caribbean. They make good alternatives to wood charcoal and cotton fibres, and bamboo can be burned or used in biogas systems to provide a sustainable source of bio-energy. Bamboo can grow at a rate of up to one metre per day, and can be harvested for productive use after 3-7 years, compared with 10-15 years for conventional trees. Hence, using bamboo as a replacement for other wood would lead to fewer trees being cut down for processing, INBAR says. “Because bamboo grows quickly it also absorbs carbon quickly, and is what we call a strategic forest resource in the battle against climate change,” says Hans Friederich, director general of INBAR. But Ramadhani Achdiawan, a researcher from the Centre for International Forestry Research in Indonesia, underlines the importance of forest planning for the long term if countries want to use bamboo and rattan for economic growth. For instance, Achdiawan says that “rattan needs trees to support its growth, so maintaining big trees in forests is very important”. In its statement, INBAR also told UN representatives about bamboo and rattan’s potential as construction materials to build strong houses and furniture that will withstand natural disasters. I recently gave a talk about social vulnerability and earthquake losses at the Valuing Infrastructure conference in Leeds. The talk was recorded and can now be viewed on YouTube! An earthquake simulator in Tokyo, Japan shows off what a Magnitude 9 earthquake feels like. Scary stuff! Over the last 20 years, 90% of all deaths due to natural disasters occurred in low and middle-income countries. 500km high eruption plumes on Jupiter’s moon Io, the most volcanically active object ever discovered!